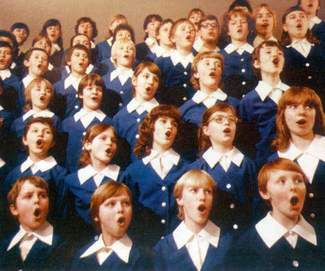 The benefits of singing in a choir extend beyond learning to sing alone. Recent scientific studies have shown that singing improves happiness, lowers stress, and decreases anxiety. Just like playing an instrument, singing can be incredibly therapeutic, while at the same time it increases our musical and thinking skills. Students will also be exposed to beautiful songs that will add to their cultural knowledge and appreciation for creativity and writing. By joining choir, students will gain a better education, improve their mental health, and have fun. Students must learn to recognize tones as they listen to others and sing themselves. Moderating their own voice teaches both concentration and discipline, and, in order to learn to sing properly, students must be able to practice good listening skills, which is a great asset for students of any subject. This kind of singing also encourages students to better appreciate music and recognize harmony and beauty in languages as well. By singing along with musical instruments or accompanying others, students will learn to assess music and songs in a new way. This enriches their whole music education experience and teaches them to exercise new methods of thought and analysis, all while working together with their fellow students. The choir is a great group activity that will enhance our students’ ability to work together. It teaches them to cooperate successfully with their peers, both musically and socially. This will also assist students who are learning a new language, since their communication skills will improve right along with their ability to control sounds and enunciate more clearly. These improved pronunciation skills will help students to express themselves better and with greater confidence. When singing, they will also learn to control their breathing and be exceptionally aware of how they are conducting themselves and using their voice. Singing in a choir will introduce students to many songs, adding a new layer to their appreciation of music and understanding of world culture. There are songs well-suited to young students, and, as children age, they will learn more mature songs that will keep them entertained and interested while also expanding their education. Beautiful songs are like poetry, and even when students sing children’s songs, they are engaging in a cultural tradition that dates back to the earliest human civilizations. Another wonderful asset that children can gain from this activity is self-assurance. Performing in a choir will teach students to relax more in front of an audience and to have more confidence. This is very beneficial for shy students, and the positive effect of these experiences can last a lifetime. By participating in choir, students will learn poise as well as how to cope with pressure. They will feel surer of themselves, and therefore they will be more willing to try new experiences. In addition to all of these skills, which are so important for success at school, at home, and in life, singing in a choir will benefit students by making them happier and less stressed. Studies have found that singing releases endorphins in the brain, giving us a feeling of pleasure that can relieve anxieties and fears. Fewer negative thoughts mean that students will be happier and more confident. The good feelings caused by these chemicals also mean that students will associate their education and cooperation with others with positive thoughts and emotions, a great benefit that will assist them in all their future endeavors. Singing in a choir offers incredible benefits to students of all ages. Learning to sing in a choir will teach students skills they need for playing instruments, language, and life. From scales to confidence, the skills and knowledge that they will accumulate are truly meaningful, and the benefits they gain from the experience will assist them in achieving all of their goals. Accompanying all this knowledge are the mental benefits of singing that, long known to singing and musicians, are continually being verified by science. Singing will improve students’ mental well-being and may offer many other benefits still unknown to us. If you want your child to gain valuable new skills, socialize, and experience rich cultural traditions, please consider allowing them to sing in choir.